Will SUMMIT reach the peak in COPD? The Study to Understand Mortality and Morbidity in COPD (SUMMIT) is a randomised controlled trial conducted in patients with COPD and comorbid cardiovascular disease, designed to assess the ‘impact of Fluticasone Furoate/Vilanterol combination (FF/VI) and its individual components on the survival of patients with moderate COPD and either a history of CVD or at increased risk for CVD’.1 Fluticasone furoate is an inhaled corticosteroid (ICS) and vilanterol is a long-acting β-agonist (LABA). The trial is enrolling 16 000 such patients with moderate COPD randomly assigned to once daily treatment with this ICS–LABA combination, the ICS only, the LABA only or placebo. Patients in this event-driven trial will be followed up until 1000 deaths occur, which is expected to take up to 44 months. Mortality is the primary endpoint and the primary comparison is between the ICS–LABA combination and placebo. The study is designed as a superiority trial with 90% power to detect a 30% reduction in all-cause mortality when comparing the ICS–LABA with placebo at the two-sided 1% significance level. Secondary endpoints will also be studied, including lung function decline and composite cardiovascular events. The design of SUMMIT is similar to that of the Towards a Revolution in COPD Health (TORCH) trial,2 with the exception that SUMMIT focuses on a study population of patients with moderate COPD and at cardiovascular risk. As well, while all patients in TORCH were followed for an exact 3-year period, SUMMIT being event-driven is expected to follow-up patients between 15 and 44 months. At first glance, the SUMMIT trial appears to have set unattainable goals. Indeed, the magnitude of the targeted effect in terms of power, a 30% reduction in all-cause mortality (HR=0.70), seems overly ambitious. In the TORCH trial, the target for this same outcome was a 27% reduction (HR=0.73) with an even smaller sample size. Moreover the primary outcome is all-cause mortality, rather than cause-specific mortality. Because of the nature of the study population, one would expect that respiratory or cardiovascular mortality be the focus of the outcome, particularly in view of a rationale for this trial, namely, that ‘combination treatment seemed to have a similar effect on respiratory and cardiovascular mortality in the primary TORCH report’.1 ,3 Including non-respiratory and non-cardiovascular deaths in the outcome can be thus perceived as potentially diluting any beneficial effects of the treatment. In all, it can be construed that SUMMIT set the bar much too high to find significant effectiveness for the drug and, if a benefit is indeed reached with this trial, it will be against all odds. Not necessarily so. In fact, several methodological aspects of the study design could affect the results in the other direction. The design of the TORCH trial revealed several concerns that could have led to biased estimates of the effects of the ICS–LABA combination inhaler on mortality and on the secondary outcomes.4–8 Many of these methodological limitations are still present in the design of the SUMMIT trial and could also affect the estimates of this trial. In this paper, we review these methodological issues in the context of the SUMMIT trial and discuss how they could potentially affect the results of this trial and the interpretation of the data. The SUMMIT trial is clear about the study question, aiming to ‘test the hypothesis that treatment with combined inhaled corticosteroids and long-acting β-agonists will reduce mortality when compared with placebo’.1 However, here again, the patients in the placebo comparison group in SUMMIT who were on maintenance therapy when they entered the study will also have them discontinued at randomisation and replaced by a placebo during follow-up. One is justified to question whether using such a comparison group is actually appropriate and whether it does not provide an inherent advantage to the treated group by giving placebo for years in replacement for pretrial maintenance therapy. These effects are presented below. When study patients entering the trial must terminate their maintenance treatment at the time of randomisation, such discontinuation becomes an inherent component of the intervention when the discontinued drug is of the same class as the study drug. This phenomenon was illustrated using data from the OPTIMAL trial that assessed the effect of adding ICS to long-acting bronchodilators in COPD patients on the incidence of exacerbation over 1 year follow-up.9 A reanalysis showed that the overall HR of exacerbation associated with ICS relative to bronchodilators was estimated as 0.79 when all subjects were combined. However, among the patients who had previously used ICS and had to discontinue, the HR was 0.71, while for those who had not used ICS and thus did not have to discontinue, it was 1.11.5 In essence, this phenomenon warns that an overall effect estimate in such a trial is comprised of two different components: the effect of discontinuing the drug among the previously treated who had to discontinue and the effect of initiating the drug among the treatment-naive users. This effect was present in the TORCH trial where over 60% of the placebo patients had to suddenly discontinue their maintenance therapy and use placebo for 3 years. In the context of the SUMMIT trial, we illustrate this phenomenon focusing specifically on the primary comparison between the ICS–LABA combination and placebo. Figure 1 depicts three different sources of discontinuation. First is the subgroup of patients who will be on an ICS–LABA combination before randomisation and who will be assigned to either the study ICS–LABA combination or placebo. This contrast will clearly provide a direct effect of the discontinuation of the combination drug, not its initiation. 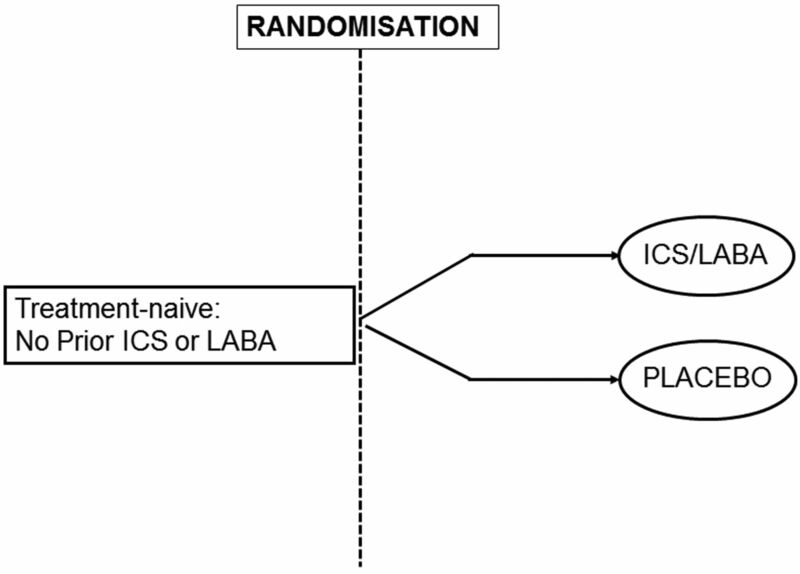 Figure 1 also shows that the patients who stop their ICS at randomisation and are assigned to the study ICS–LABA combination or placebo during follow-up will contribute a double effect, namely, the effect of ICS discontinuation and the effect of initiating LABA. Similarly, the subjects who were on LABA will contribute to the effect of LABA discontinuation and the effect of initiating ICS. Depiction of the six subgroups of patients that result in various effects of drug discontinuation. 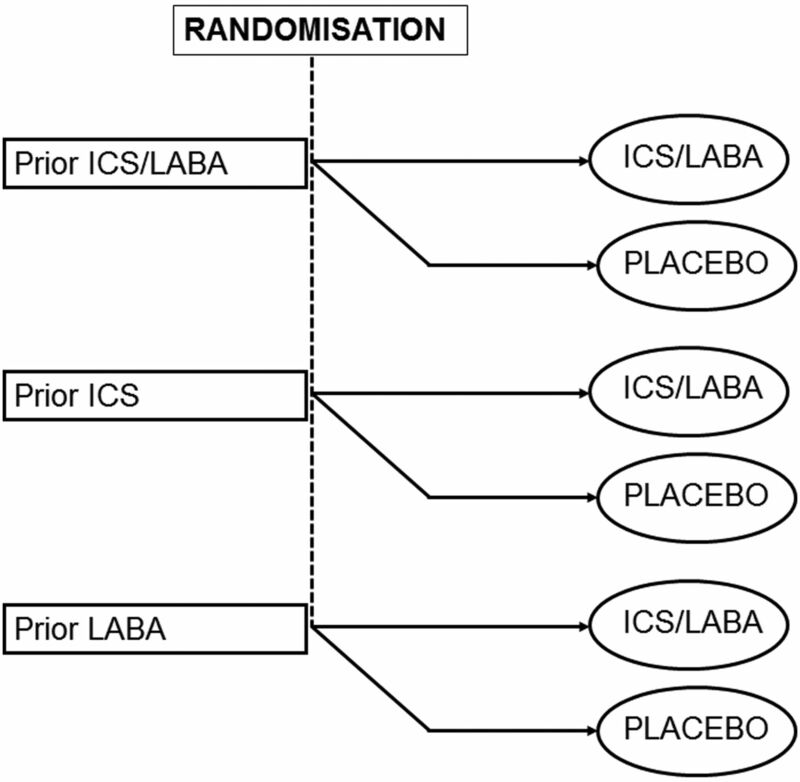 Recruitment into the trial on an ICS–LABA combination, an ICS or a LABA just before randomisation and assignment to ICS–LABA or placebo will lead to effects of discontinuation. ICS, inhaled corticosteroid; LABA, long-acting β-agonist. Figure 2 depicts the valid comparisons related to the desired effects of initiation of the ICS–LABA combination and its components. It shows that it is only among the patients who are treatment-naive of any ICS or LABA that the ICS–LABA combination can be directly compared with placebo to provide a valid estimate of the effect of the treatment. Depiction of the pure effect of drug initiation, based on the four subgroups of patients who were treatment-naive of ICS, LABA or the ICS–LABA combination, before randomisation. ICS, inhaled corticosteroid; LABA, long-acting β-agonist. Therefore, these depictions show that the computation of a single estimate of the effect based on comparing ICS–LABA with placebo across all four scenarios will encompass a mix of unspecific estimates of the effects of various drug discontinuations and initiations, clearly dissonant with the sought after effect of ICS–LABA. Thus, the censoring of follow-up at treatment discontinuation in SUMMIT will not affect mortality but could exaggerate the effects for the secondary outcomes such as lung function decline and exacerbations. Nonetheless, while the randomised trial is the fundamental design to evaluate drug effectiveness, it is not immune from methodological vulnerabilities that can distort its results. The mere act of randomisation is not sufficient. We showed that the SUMMIT trial will have several key methodological challenges to surmount, including the dubiousness of the placebo comparison group and the inherent effects of drug discontinuations at recruitment. As a result, SUMMIT will estimate an HR comparing ICS–LABA with placebo, but this single value will in fact conceal a mix of diverse estimates of the effects of drug discontinuations and initiations. Consequently, the result of this mega-trial may not, after all, yield a valid estimate of the sought-after impact of this ICS–LABA combination treatment that can be translated into evidence-based clinical practice in the management of patients with COPD.
. The Study to Understand Mortality and Morbidity in COPD (SUMMIT) study protocol. Eur Respir J 2013;41:1017–22.
. Cardiovascular events in patients with COPD: TORCH study results. Thorax 2010;65:719–25.
. Prevention of death in COPD. N Engl J Med 2007;356:2211–12.
. Methodological issues in therapeutic trials of COPD. Eur Respir J 2008;31:927–33.
. Lung function decline in COPD trials: bias from regression to the mean. Eur Respir J 2008;32:829–31.
. Inhaled corticosteroids in COPD: the case against. Eur Respir J 2009;34:13–16.
. Treating COPD—the TORCH trial, p values, and the Dodo. N Engl J Med 2007;356:851–4. Anonymous. Respiratory Disease Specific Programme 2000–2007. Macclesfield, UK: Adelphi Group Products, 2008.
. Bias due to withdrawal in long-term randomised trials in COPD: evidence from the TORCH study. Clin Respir J 2011;5:44–9.
. Premature discontinuation of patients: a potential bias in COPD clinical trials. Eur Respir J 2007;30: 898–906.
. Mega-trials for blockbusters. JAMA 2013;309:239–40.
. Tiotropium Respimat inhaler and the risk of death in COPD. N Engl J Med 2013;369:1491–501. Competing interests SS has participated in advisory board meetings or as speaker in conferences for AstraZeneca, Boehringer-Ingelheim, GlaxoSmithKline, Novartis, Nycomed and Pfizer, and has received research funding from Boehringer-Ingelheim, GlaxoSmithKline and Schering-Plough.